When you are living in a square-footage-challenged dwelling, making the most of the space you’ve got is a must! Sleeper Sofa – Either in a studio apartment as the only bed or in your living room as a guest bed for overnight visitors, sleeper sofas expand the way you use your space. No longer plagued with bad reputation, today’s sleeper sofas are stylish, comfortable and come with high quality mattresses for a restful night sleep. You can find sleepers in all sizes … from a twin pull-out sleeper chair, to a roomy king … though the queen size mattress is still the most common. And futons with their contemporary frame design offer another great way to fit a bed into your living room or office. Vertical Storage – When you’re short on floor space, don’t forget to get the most out of your wall space. Whether with open shelving or closed cabinets, vertical storage can help you make the most out of your tight quarters. Look to add furnishings such as media centers, book cases, accent cabinets, and room dividers. 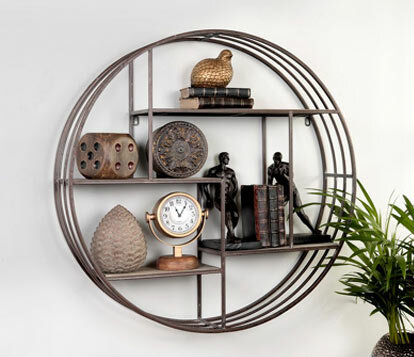 Not only will these pieces help you stay organized and manage your clutter, they bring the eye up to add interest and diversity to your décor. When done sparingly tall pieces of furniture can actually make a space look bigger by emphasizing the verticality of the room. 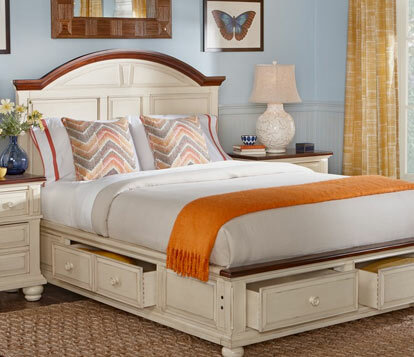 Under Bed Storage – To save space in the bedroom, look for bedframes that offer under bed storage cabinets or drawers. You can use these stash away extra linens, winter blankets, clothes or shoes; beds with storage help make the most of the largest piece of furniture in the room. Nesting Tables – Sets of two or three matching tables that nest tidily together take up just a small amount of space when stacked, but can offer triple the surface area when separated. Frequently available as end tables, sometimes you can find coffee tables that nest as well, or at least have slide out shelves. 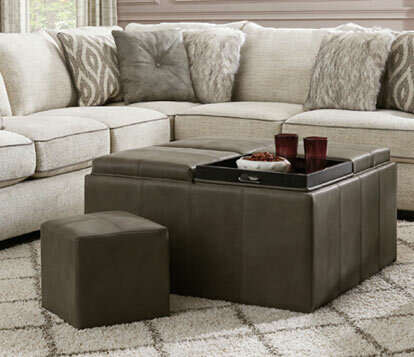 Storage Ottomans – Ottomans are great in small spaces because they are the jack-of-all trades in the living room. More than just a great footrest, group four small ottomans together (or one large ottoman), add a tray, and voila -- you have a coffee table. With a much smaller footprint than an armchair, they can offer extra seating at a fraction of the space. Alternatively, they slide around easily to be stored under a side table or sofa table and can be pulled out whenever needed. And many ottomans on the market offer storage to boot! 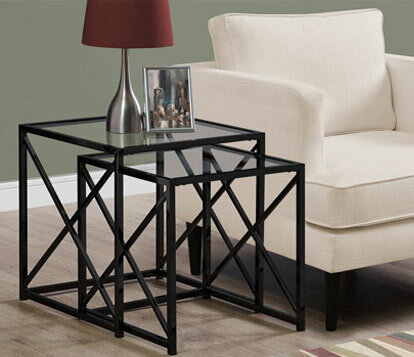 Storage Tables – Not a fan of using an ottoman as a coffee table? Look for other options that offer storage. 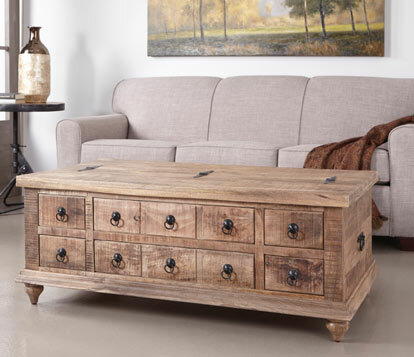 There are plenty of interesting options like vintage trunk for a coffee table or an accent cabinet as an end table. Not only will these pieces add storage to your home, by collecting unique pieces that you love, you’ll end up with a custom designed look that is as interesting as it is functional.